It's an iconic image: the frisbee floating artfully into the air and a dog leaping up to effortlessly catch it. The reality for the average, everyday family dog might be far different. Not all leaps succeed, but most dogs have a blast chasing down and catching a frisbee anyway. Better yet, we love to watch them try! 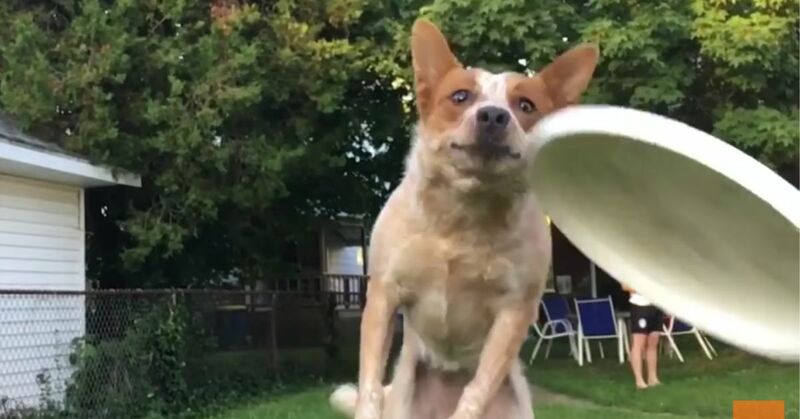 Check out these videos and the dogs who put their heart and soul into getting that frisbee, even if it's from ground level. Yo might want to take your dog outside and give it a go too! 1. Gus will let his friend handle the details. Gus the Great Pyrenees made the mistake that most people and dogs make while playing frisbee: he thought it would be easier than it looked. Thankfully, Gus has his buddy waiting in the background to pick up the pieces. Watch Gus' lazy attempt to catch in the video below. 2. This dog wins major points for effort. The throw is perfect, the arc is perfect, the catch...not so much. Just look at the dog's eyes though: he wants that frisbee so badly! Although he misses the frisbee, he does get the cameraman! Check out the frisbee fail in this clip. 3. It's a catch and a tackle at the same time. The young camerawoman who shot this video not only captured her dog's enthusiastic effort to catch the frisbee, but she withstood the full-on tackle that followed. Well done, kid! See the dramatic action in the following video. 4. Not even gravity can keep this dog from her frisbee. Bella is not fooling around, especially when it comes to her favorite frisbee. It doesn't matter if that frisbee is stuck in a tree, she will get it anyway. Watch this gravity-defying dog in the video below. 5. Nothing gets between Mika and her frisbee. Mika might be curled up in her bed napping away, or enjoying a yummy treat, but once she hears the frisbee call, she's off to find her favorite toy. Watch her fun adventure in the following clip. 6. Well, Oliver tried. It's not his fault he is directionally challenged. Two out of three isn't bad, at least in the case of this owner and her three dogs out playing frisbee. Little Oliver started out in the right direction and then veered off the grid entirely. Better luck next time, Oliver! Watch Oliver run his independent course below. 7. This dog was a little too into his frisbee. In this video, a golden retriever played a bit rough with his frisbee, and, well, it isn't going to "frisbee" anymore. Thankfully, there are many more frisbees out there, buddy. Just don't try to take the next one apart. Check out this silly dog in the following video.